Vuo 1.1 introduces some major new features, like high-quality offline movie exporting and realtime movie recording! Now that Vuo 1.0 is complete, we're eager to expand what Vuo can do! Please help us prioritize what we develop next by voting in our poll. Thanks for helping Vuo reach version 1.0! Now we need to help Vuo reach more people — so we're simplifying the way we sell Vuo. 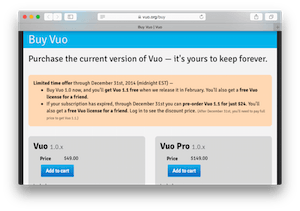 You can check out our new Buy Vuo page to see the new deal. We've released Vuo 1.0! You can download it now (and there's a free trial available!). Vuo 0.9 comes with 79 new nodes, and over 30 new example compositions to help you learn how the new nodes work. We've added nodes for receiving live video input via QuickTime — including the built-in iSight camera on MacBooks and iMacs. We also have new nodes for filtering images, blending objects and layers, using lists, and controlling the logic flow in your composition. We added several new features to the editor, like the ability to drag media files directly onto the canvas and have the corresponding node automatically pop up. You can now drag cables backwards and edit published ports with sliders (essential when creating compositions for VJ apps like CoGe), and search for nodes by port names, too. We've significantly improved stability and live coding performance, and have many more improvements in the works for 1.0. Asheville music festival, plus the composition gallery and community spotlight.